A database report is the formatted result of database queries and contains useful data for decision-making and analysis. Most good business applications contain a built-in reporting tool; this is simply a front-end interface that calls or runs back-end database queries that are formatted for easy application usage. How to increase the row limit in Jasper Server. From implementing a password expiration date, to datatype conversions and file export options, these are some useful settings I've found in Jasper Server. I recently went through setting up a JasperReports Server using the AWS EC2 instance, and this article will cover some basic administration tasks I had to perform. 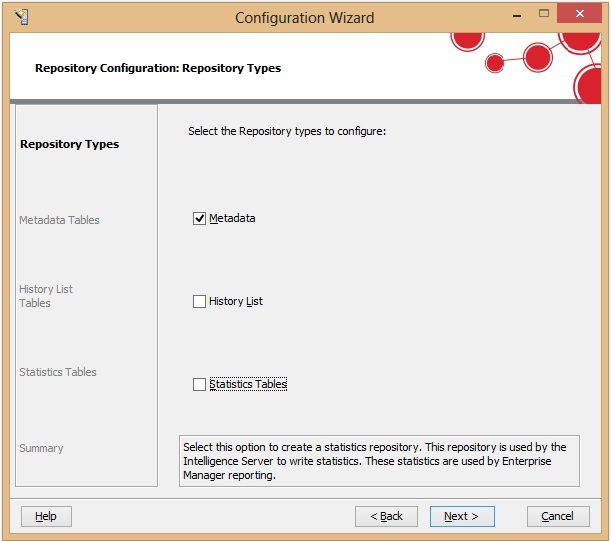 Jaspersoft Studio is a plugin for Eclipse that lets you create reports from a datasource. In this article, we'll go over creating a report from a default template and setting up a datasource that connects to your database. In my previous Article I discussed some basic understanding of Microstrategy that how we can get in Intro of Microstrategy (MSTR). Now it's time to get our hands dirty with Development..
After installation we need to create Report / Dashboard which is our basic requirement for Analyzing the Data. 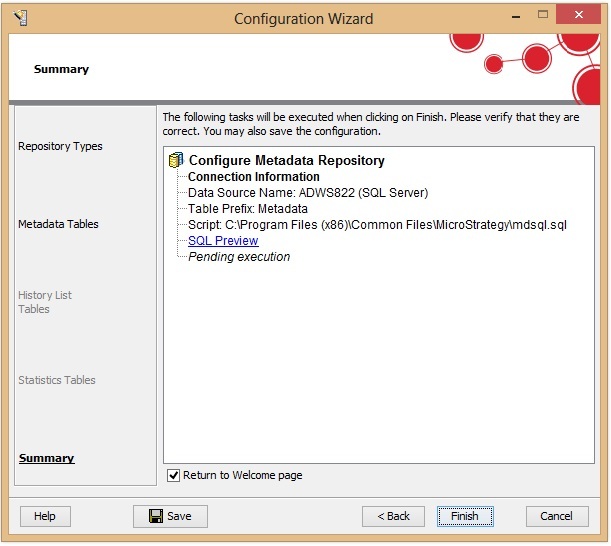 First we have to add Metadata to the Source Database which stores the information which acts as bridge between source Database and Microstrategy. 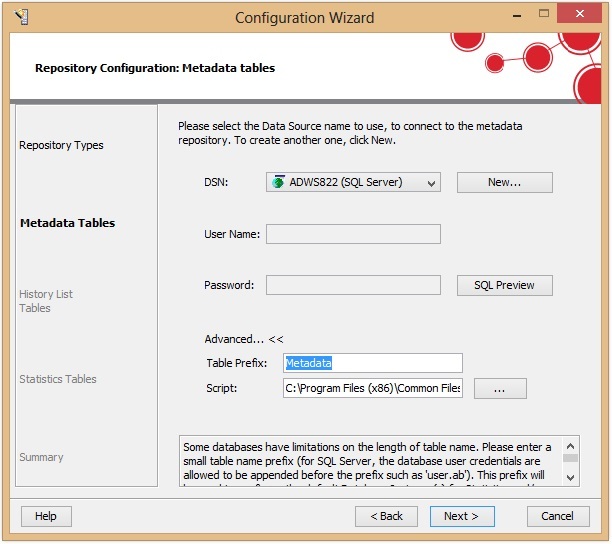 Check in Metadata which will create Metadata tables to the Source system. 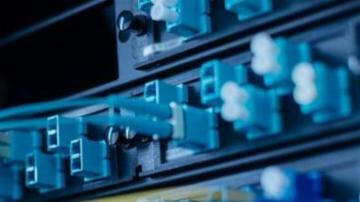 You have to define the Source for which DSN needs to be configured if not configured. Click on New in the above screen and MSTR Connectivity Wizard will open for new DSN Creation. From the Select we will select Microsoft SQL Server for this article however you can select any of the listed ODBC Drivers. Enter the SourceName , Servername and Database name which will be source for MSTR Report. I have checked Windows Authentication click on Test and Click on Finish and New Data Source Will be created and it will appear in the DSN DropDown list. Now enter any prefix which will be added to the tables of metadata so that you can easily identify source and Metadata Tables. 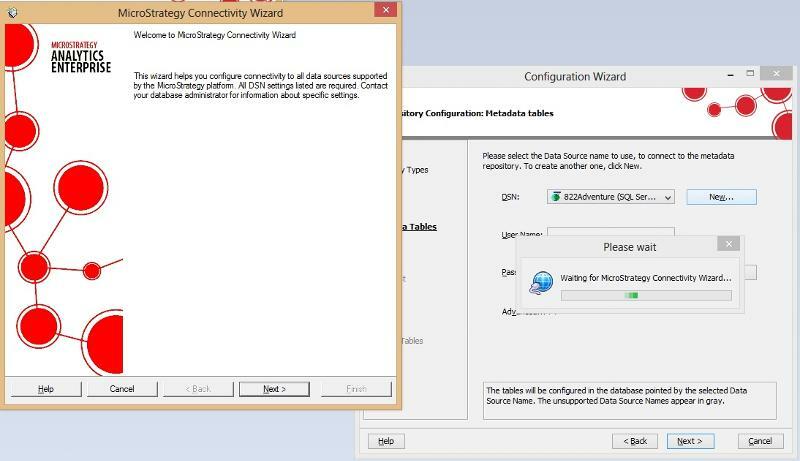 Click on Next and Data Source will be Configured. The next step would be to configure Intelligence Server. 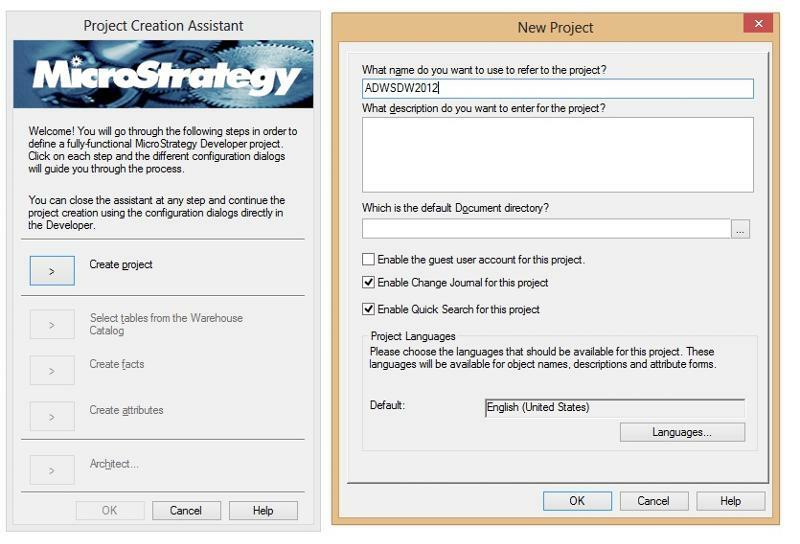 In my precious Article we saw the Configuration part for Microstrategy which included Metadata Creation and DataSource Preparation as a pre requisite for Microstrategy Project. Now here we will look that how we can create Project Source and Project in which we will be creating report for the selected DataSource. Now We need to create Project Source Manager which can be created from Microstrategy Developer or from Project Source Manager tool. We will add Project Source Manager from Microstrategy Developer/Desktop. 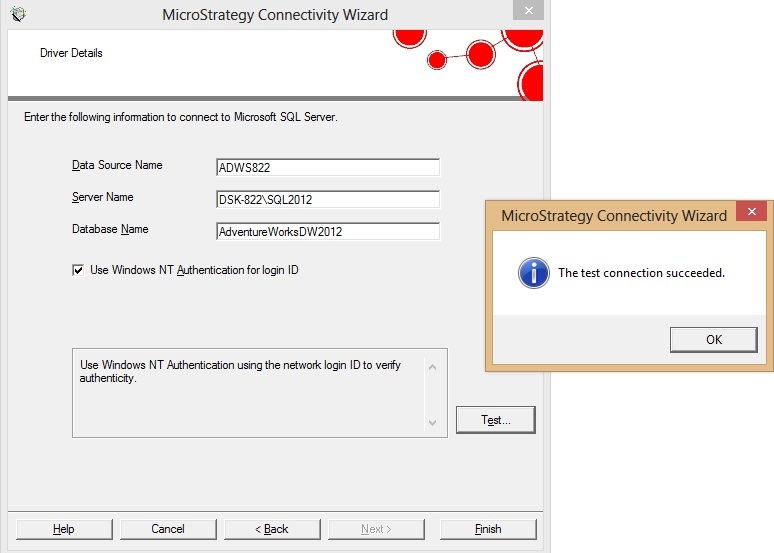 Click on Microstrategy Developer from Start Menu and the Below screen will appear. 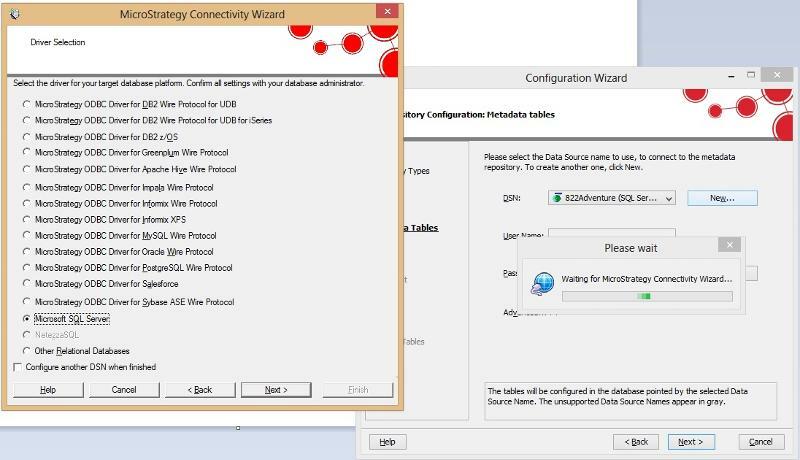 In the Server Name enter your MSTR Server name or Click on Active Server Button which will show all the Microstrategy Active Servers on which this project will be created. 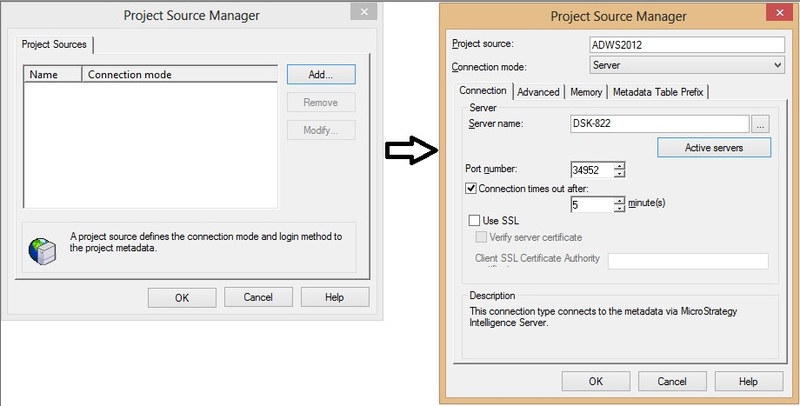 Now Click OK.
Now we will create Project in this Project Source Manager. For this Click on Schema and Click on Create New Project. This will open project Creation Assistant / Wizard. 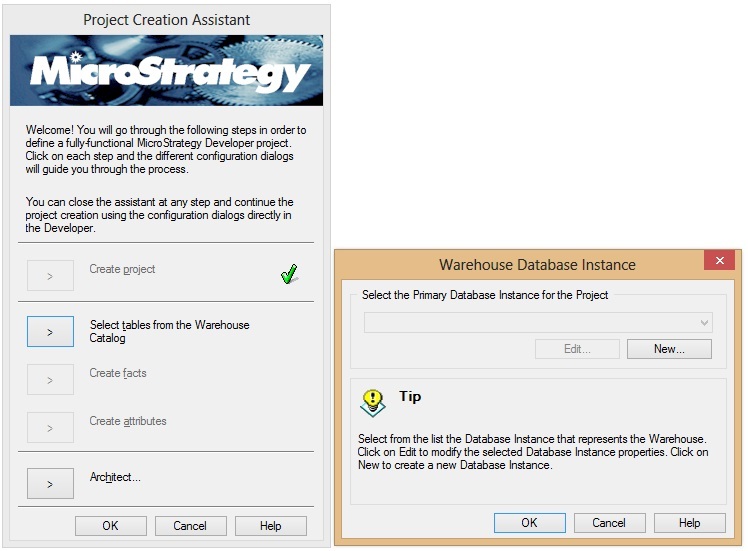 Click on Create Project and Give suitable Project name and Click OK.
Now Click on Select Tables from Warehouse Catalog Button and Database instance Wizard will open. 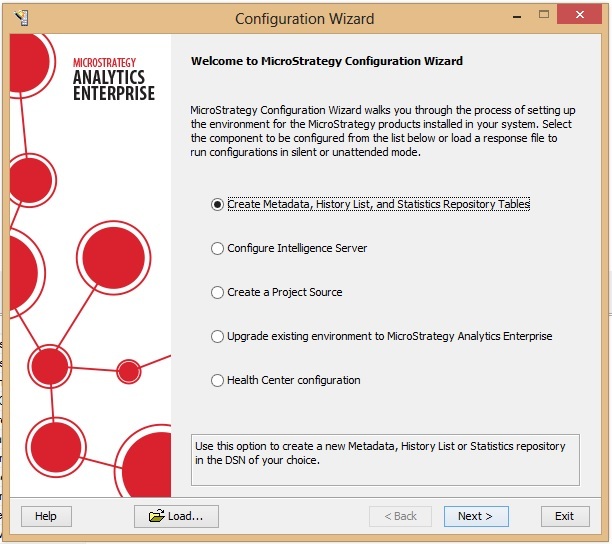 I am very much excited today since I'm going to share something very exciting Tool used for Analytical Reporting and that's nothing but MICROSTRATEGY. The MicroStrategy supports interactive dashboards, scorecards, highly formatted reports and automated report distribution. It includes web, desktop (for developers) and Microsoft Office integration. 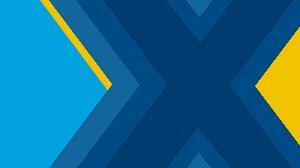 MicroStrategy Mobile also supports mobile BI. For Bried it has got both Free Edition and the Commercial one. You can get familiar with it using the Free Editions available. Both Desktop application (Analytics Desktop) and Web Application Analytics Express as SAAS (Software as a Service) cloud based service available free for One year with limited access and features. 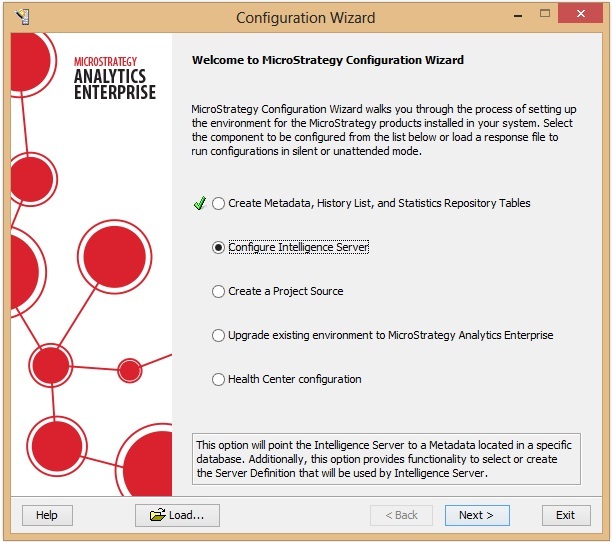 Apart from this free edition Microstrategy comes up with Enterprise Edition - Analytics Enterprise having lots of features supported which are not available in the Free Desktop and Cloud service edition - Edition Comparison is shown in detail in the Compare-MSTR-Exitions.pdf. In an SAP BI BO Integration project when a BO universe is built on a BEx query, there can be an issue of unit & formatted value objects not getting generated in a BO universe for some key figures. This results in an issue whereby the developer won’t be able to display the unit of that particular key figure in any BO report. and if A and B are in different currencies, then resultant currency should be shown as *. But not displaying any unit/currency at all would be an issue. In the above mentioned scenario, if Revenue is created as a local formula in a BEx query, then there is a possibility that the unit and formatted value objects of Revenue not getting generated in BO Universe. In this case, we can still arrive at the unit or currency of Revenue by identifying the individual key figures which are part of the Revenue formula. That is, if we have the unit objects of A, B, C key figures available in the universe, then we can arrive at the unit or currency of Revenue. 3. Set the WHERE clause to use a split string function so it can parse out the comma seperated values into an array & back out to the calling procedure.